Composting food scraps is a great eco-friendly way to keep organic materials out of the landfill. 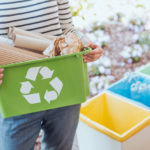 If you keep an indoor or outdoor garden, composting is also a way to provide nourishing materials in which to grow flowers, herbs, and vegetables. You’ll save money and keep the packaging materials for store-bought compost out of the landfill, too. 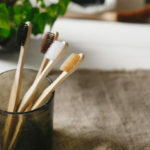 Here are some tips on how to compost in an apartment! For those living in apartments, composting can seem like an impossibility. Apartment-dwellers of the world, take heart! It’s actually easy to have a functioning compost system in a small, indoor space. According to the EPA, organic materials decomposing in the anaerobic environment of a landfill release huge amounts of methane which traps heat in the atmosphere 28-36 times more effectively than carbon dioxide. Composting allows these materials to decompose naturally and be returned to the soil or used in your indoor garden. The actual process of composting is super easy. Collect organic materials (like the stems of vegetables, leftovers and even paper towels) in a small receptacle in the kitchen. A composting bin like this is a common choice, but a large bowl does the trick just as well. When your bin is full, you’ll need to empty it into a larger container to finish breaking down into usable compost. You have two options: If your town or city has a residential composting pick-up, great! You can just empty your scraps right into the bin just as you would your trash or recycling. Even better is to compost your organic materials right in your home so you can use the finished product to grow your own vegetables or herbs. Vermiculture (using worms) is a compact and easily maintained system. You can find a thorough explanation of one type of vermiculture system here. If you have space on a balcony or in a garage, you can utilize a turning system similar to this. 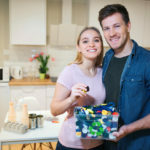 Learning how to compost in an apartment is an excellent way to support your eco-friendly lifestyle. 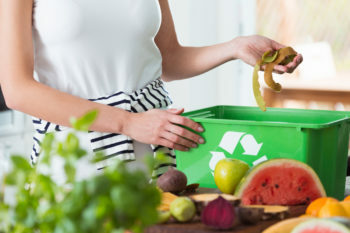 However you decide to break down your food scraps, composting is simply an effective step towards sustainability. 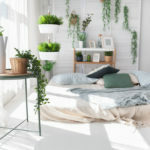 Please contact us for more ideas about living green in a small space.